Osteoporosis is a major public health concern worldwide. Although osteoporosis is more prevalent in women, it can also affect men. This disease can occur at any age and in any racial or ethnic group. However, it is more common in postmenopausal women, especially Asians and Caucasians . In the United States (US), 13-18% of women above the age of 50 years have osteoporosis . Although there is limited data on the prevalence of osteoporosis in Asia, it has been estimated that by the year 2050, 50% of hip fractures will occur in Asia due to an increase in the elderly population . In 1994, the World Health Organization (WHO) defined osteoporosis as a “disease characterized by low bone mass and micro-architectural deterioration of bone tissue, enhanced bone fragility and an increase in fracture risk”  (Figure 1). Typically, osteoporosis is a “silent disease”. There are usually no symptoms until the first fracture occurs .As the disease progresses, symptoms may include back pain, fractures, loss of height, skeletal deformity (kyphosis or kyphoscoliosis), neck strain, mid abdominal pain, alterations in bowel functions, such as constipation and rarely, lung disease . 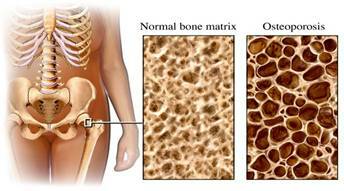 Osteoporosis is the most common metabolic bone disease in developed countries . The above is an abstract on the Osteoporosis Courseware available online. Please LOGIN with your existing MPS username/password details to begin. Choose to purchase the course "Osteoporosis" - we have currently priced the course at USD 20 / USD 30 for non-MPS members. you can proceed to 'purchase' for FREE (no payment is required).